It was time for a change. 1070 lines of poorly organized CSS was too much. A theme that was not based on HTML 5 and put mobile second wasn’t the way I wanted things to be anymore. So I started over. 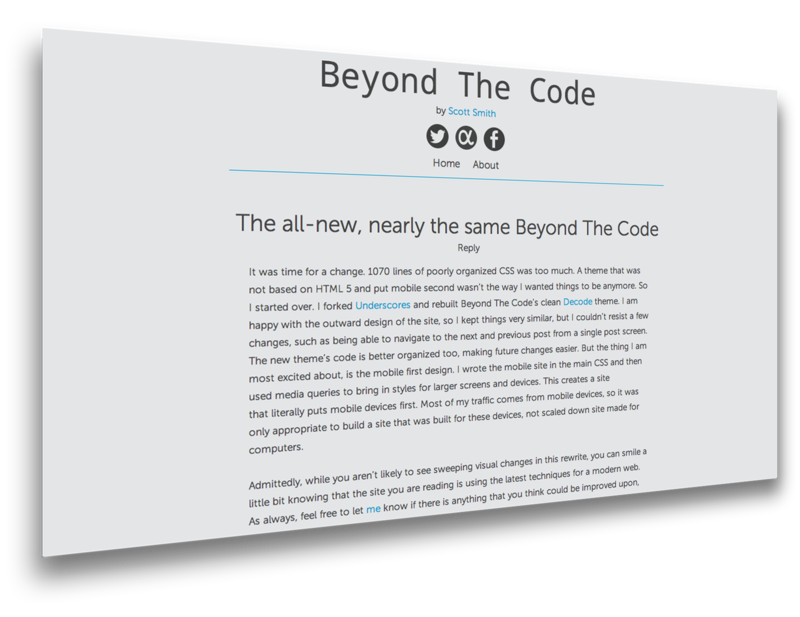 I forked Underscores and rebuilt Beyond The Code’s clean Decode theme. I am happy with the outward design of the site, so I kept things very similar, but I couldn’t resist a few changes, such as being able to navigate to the next and previous post from a single post screen. The new theme’s code is better organized too, making future changes easier. But the thing I am most excited about, is the mobile first design. I wrote the mobile site in the main CSS and then used media queries to bring in styles for larger screens and devices. This creates a site that literally puts mobile devices first. Most of my traffic comes from mobile devices, so it was only appropriate to build a site that was built for these devices, not scaled down site made for computers. Admittedly, while you aren’t likely to see sweeping visual changes in this rewrite, you can smile a little bit knowing that the site you are reading is using the latest techniques for a modern web. As always, feel free to let me know if there is anything that you think could be improved upon, unless it is IE 7 compatibility in that case, I recommend you don’t waste your time and instead put it to good use. I love the picture Jared Erondu paints of how age can be perceived. In truth, your age is merely the number of times you have circumnavigated the sun. Unfortunately, many people use it as a measure of maturity, which is a terribly misguided use of this statistic. A 16 year old can easily be more mature and better suited for a job than a 20 year old (and vice-versa). Granted, there are a more legal restrictions minors have to deal with. However, this is not normally a problem for most of the positions in technology careers today. Past experience and a good interview are a better indicator of a person’s ability to perform well at a job. I’m glad to see that more companies are employing younger people, but we still have room to improve. That code can make the links on a page transition smoothly between colors. Unfortunately, very few websites bother to use CSS transitions on their websites. Why is this? One possible reason for this is that CSS transitions are only supported in modern browsers, however this is not a reason to not use transitions because (if used correctly) they don’t negatively affect the behavior of a site when a browser does not support transitions. So perhaps this isn’t the case. One may think that perhaps web designers are not well informed on the topic of CSS transitions, and therefore don’t attempt to use them. But this is likely not the case. Designers of even the world’s biggest websites like Facebook and Google are certainly not ignorant about transitions and their compatibility with other browsers. CSS transitions are also not a difficult skill to master and there are plenty of guides on the Internet to learn to use them, so I have a difficult time believing that anyone is having a difficult time learning how to use them. So if it isn’t compatibility and it isn’t ignorance, why is the use of CSS transitions not widespread? If a few lines of code can improve the look of a site of even in a subtle way, why not implement it in your site? To be honest, I don’t know the answer to this question. I am writing this post as an open question. Is there a good reason not to use simple transitions on a site? Why don’t the world’s largest sites use them? Is there a something that I am missing here? If you have the answer, please don’t hesitate to let me know via the reply tool at the top of this post. I keep re-reading this article from Sacha Greif on design versus functionality. It is an excellent example of how a well-designed object should work as good as it looks and a newer design should perform better than its predecessor. I’ve read my last work of fiction for a long time. Now that I have finished that book, I’m going to stick to books that are informative, inspirational, and instigating. Books that tell fictional stories bring us into new worlds, they allow us to use our imagination, but following my previous post, it is better to create than consume. Although I am consuming content either way, the works which I am planning to read are of the sort that would lead me to create. I decided to make a reading list to set some objectives. I am not going to set a date by which I want to be done reading. I would rather take my time with each text and take away ideas rather than check another book off my list without gaining anything from it. I challenge you to read books that will make you a better person. Fiction is fun, but it shouldn’t be the only thing that you read. Here is my reading list. You can use it, but really, you should make your own. It’s so much more fulfilling to be a creator rather than a consumer. Seriously, I’ve bought tons of crap in my life and very few of those things have had any substantial impact on me. The things I have made, (sadly far fewer in number) have had substantial impact on my life and even other people’s lives. It is one of the higher honors in life to be able to create something that impacts other people’s lives. Get out in the world. Dream. Build. Create. Today we’re adding support for Stream Markers to the API. This will allows clients to sync where you are in your stream, global, and even in individual threads between clients. People who don’t know what they are doing shouldn’t stand in the way of people who do. Instead of other sites where every place gets 3.5 stars, we come up with our scores using the same Foursquare magic that powers Explore. We look at signals like tips, likes, dislikes, popularity, loyalty, local expertise, and nearly 3 billion check-ins from over 25 million people worldwide. And, with every check-in and Explore search, our scores will get smarter and better. Just one question, why does Apple still use five star ratings in the App Store? They have so much data at their disposal. How much time a user has spent in an app, the number of times it has been downloaded, how often it has been shared on Twitter, and so many other possible data points. Apple has Genius for apps, yes, but it is terrible. I bet there is a tumblog out there with examples of the horrendous suggestions it makes. Apple should remove the five star rating, switch to a like-based system, or move the ball forward in this area. While we are at it, I have yet to find a place where App Store reviews are helpful, I get apps because people recommend them to me, not because they get raving reviews on the App Store. What would be really nice to see is commonly used apps from the people I follow on Twitter. That would be much more helpful than seeing what “DJDJDJz” (that is an actual screen name) thinks of Summly (in case you have to know, he “luuuuuves” it, but naturally fails to explain why.) The reviews on iTunes cater to poorly-informed, badly-written, and polarized reviews. In the end, the App Store’s discovery model does not work. The way I, and most people I know, find apps is through personal recommendations. (Usually when a friend of mine gets an iPhone, the first thing I am asked is what apps they should get.) As a bonus, apps wouldn’t ask you to give them a five star review every time you download or update them if reviews were removed. If five star ratings and reviews were removed in favor of a recommendation system, I believe the App Store could be more engaging for users. 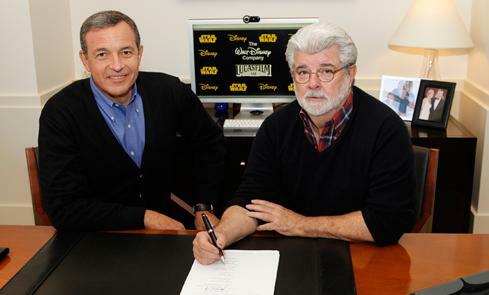 Disney today announced that it had acquired Lucasflim for 4.05 billion dollars. M.G. Siegler interestingly, points out that this is about half of what they bought Pixar for in 2006. In the same press release, Disney stated they were planning on releasing a seventh episode in the saga to be followed by a new movie every two or three years. Seeing how well Disney has handled its acquisition of Marvel, I actually don’t see them destroying the Star Wars we all know. In fact, the bigger questions I have are where they will take the plot of Star Wars and how fans will react to the new films. It is a very wise move for George Lucas who said that he, “thought it was important to set up the transition during my lifetime.” I wish George Lucas the very best as he goes on to be a “creative consultant” at Disney, hopefully meaning that he can keep the films in line with what a fan would expect from the franchise. May the force be with you.